This write up is from my experience of installing an Innovate LC2 Wideband in my 1G DSM using the DB gauge. The install will be very similar on a 2G DSM and I will point out any differences. First things first, there are two main parts of the wideband; the controller and the gauge. Each make up what we call a wideband. Technically, the wideband is not the gauge, it is the controller itself. Furthermore, you have other parts of the unit. When buying your LC2 wideband kit, you will have the controller, the gauge, the wideband 02 sensor (Bosch 4.9), and the sensor cable. You need to decide where you want your wideband o2 sensor bung. You have a few options. The first option is highly suggested by Innovate themselves and my personal favorite. Weld your bung somewhere on the exhaust, preferably on the downpipe about 18″ or more from the turbo. Doing this will allow you to run the wideband to itself, on its own. The second option, and more common option these days, is to remove your factory front o2 sensor and install the wideband o2 sensor in its place. 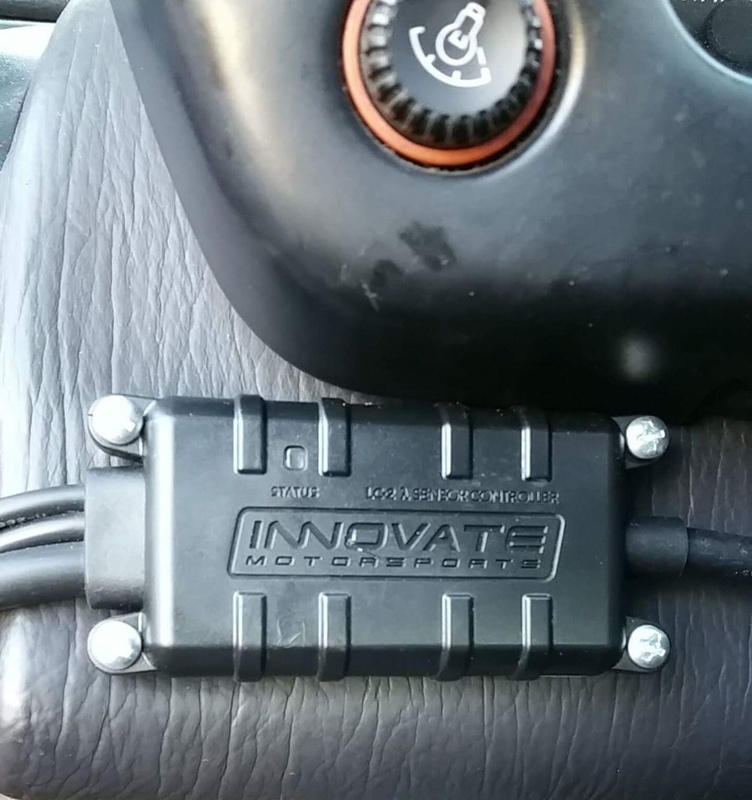 This is not recommended by Innovate but is proven to work with our cars and our tuning capabilities. It involves some extra wiring which I will cover below. A third option is to remove the rear o2 sensor and install the wideband o2 sensor in its place. Most of us don’t even use a rear o2 sensor and removing it will not affect the performance of the car but WILL generate a new check engine light unless wired up correctly. 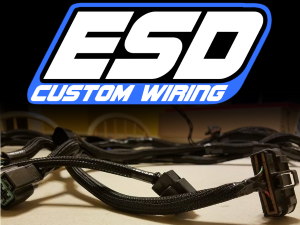 There are two pigtails of wiring involved with the complete wideband kit; the controller side and the gauge side. Controller Side Wire Colors- RED, BLACK, YELLOW, BROWN. Gauge Side Wire Colors- RED, BLACK, YELLOW, WHITE. REQUIRED- Both RED wires go to any 12v SWITCHED power source. Radio wiring, cigarette lighter wiring, etc. REQUIRED- Both BLACK wires go to GROUND. REQUIRED for use of the gauge- The WHITE wire of the GAUGE goes to the YELLOW of the CONTROLLER. OPTIONAL/NOT NEEDED- The YELLOW wire (I didn’t use it and taped it up) from the GAUGE goes to your headlight wiring for use of dimming options. REQUIRED ONLY IF YOU INSTALLED THE WIDEBAND O2 SENSOR IN PLACE OF THE FACTORY O2 SENSOR- The BROWN wire of the CONTROLLER goes to the front o2 sensor wire at your ECU. With a 1G, the pin you need to wire into is pin 4, which is supposed to be a solid WHITE wire, depending on the year of your 1G. OPTIONAL/NOT APPLICABLE WITH 1G- The YELLOW wire of the CONTROLLER can be ran to your factory rear o2 sensor pin on a 2G if you are using the wideband o2 sensor in place of the front o2 sensor. The 1G’s do not have a rear o2, thus this is NA to a 1G. One future that Innovate offers with their widebands that no other company does, is a calibration feature. 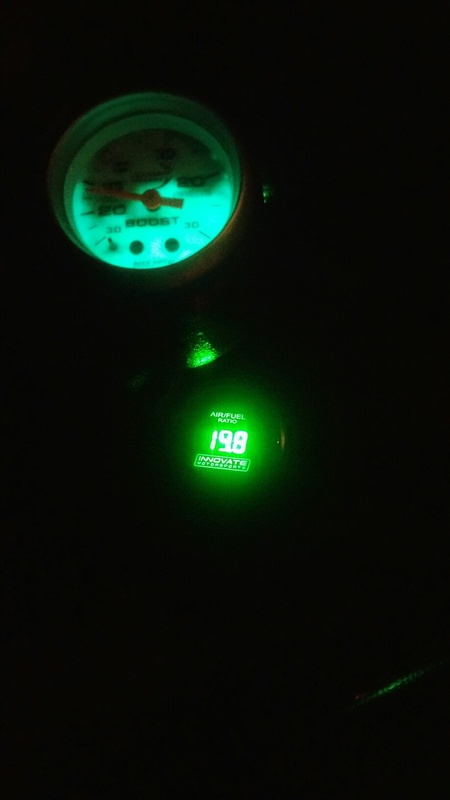 This makes the gauge more accurate upon initial use and throughout time. STEP 1- With the wideband controller and gauge installed but the wideband o2 sensor not connected to the exhaust (in free air) AND completely unplugged, turn the key ON (apply power to the controller). The LED light will light up on the controller. It will blink red in a two blink sequence. This is indicating Error 2 for an error code of No Sensor Detected. This is normal. Keep the unit powered for at least 30 seconds. STEP 2- Key off and then plug your wideband o2 sensor into the sensor cable. Note, the sensor still not connected to the exhaust. Key on, the LED will blink green for several seconds before rapidly flashing green, and then eventually it will light up a solid green. This is to indicate that the calibration process is complete. You can then install the wideband o2 sensor into the exhaust and start the car. ***NOTE*** DO NOT START THE ENGINE WITH THE WIDEBAND O2 SENSOR INSTALLED IN THE EXHAUST STREAM WITHOUT APPLYING POWER TO IT. THIS WILL IMMEDIATELY DAMAGE THE SENSOR.